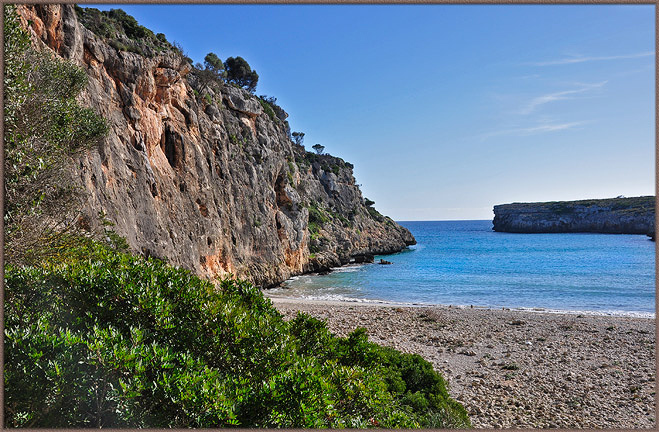 Largest of the Balearic Island group, Mallorca’s geological relief is both surprising and exciting. 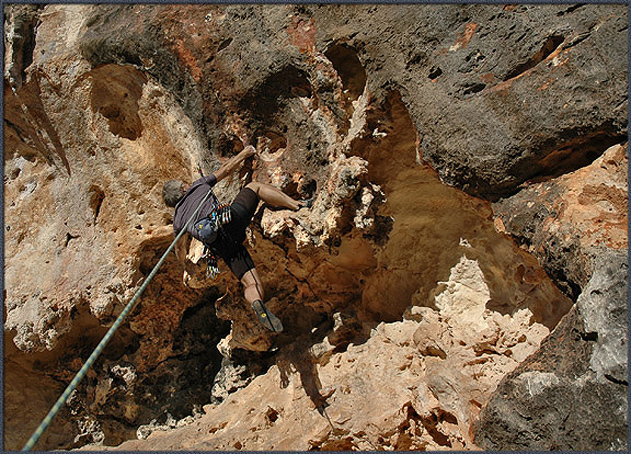 Mostly limestone, it ranges from sea cliffs and caves to deep canyons, walls dripping with tufa to rugged mountainous terrain. 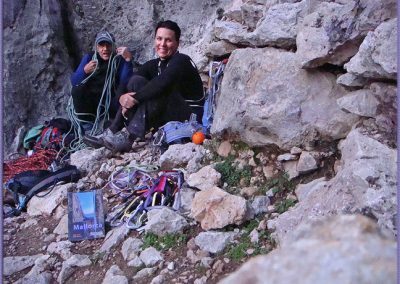 The draw is not only the unique and highly varied sport climbing, but beautiful beaches, hidden coves, a colorful past and a friendly local population whose beliefs, customs and mores seem to vary depending upon which hamlet you are in at any given time. This oddity stems from a history with beginnings lost in the mists of time, although burial chambers and traces of habitation during Paleolithic times (6000 BC) have been uncovered. The full panoply of Mediterranean civilizations have influenced this curious place, including Phoenicians, Greeks and Romans, Vandals, Byzantines, Muslim raiders from North Africa and, of course, the Spanish. Not to be trifled with, Balerian men were exceptionally skilled ‘slingers‘, a trait supposedly nurtured from birth and continued in ‘schools‘. It is said that mothers only allowed their boys to eat bread when they had knocked it off a post with the sling. The ’balerics’ hired out as mercenaries, going into battle with bags of rocks and three slings of different lengths – and they rarely missed. They took their pay in wine and women rather than gold or silver. It is said they ’loved’ their women – they still do. Don’t mess around here!! 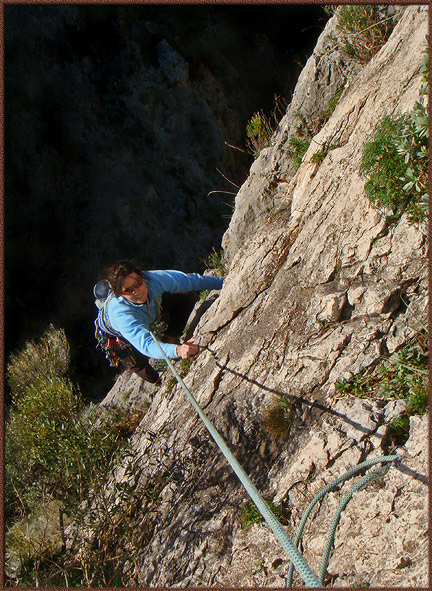 Tourism began in earnest during the 1950’s and climbers began exploring the vast potential of Mallorca’s vertical terrain during the 1980’s. 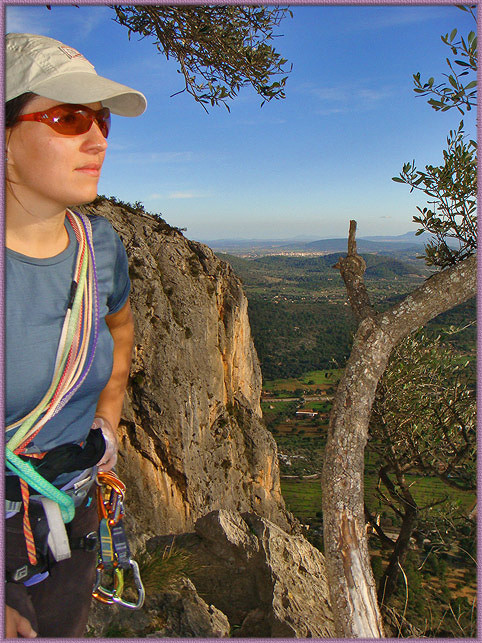 ’Mallorca; a rock climbing guidebook to the island of Mallorca’ by James and Glaister found at rockfax.com covers 21 fascinating areas (get this book, it’s very well done and informative). More areas are being developed each year. 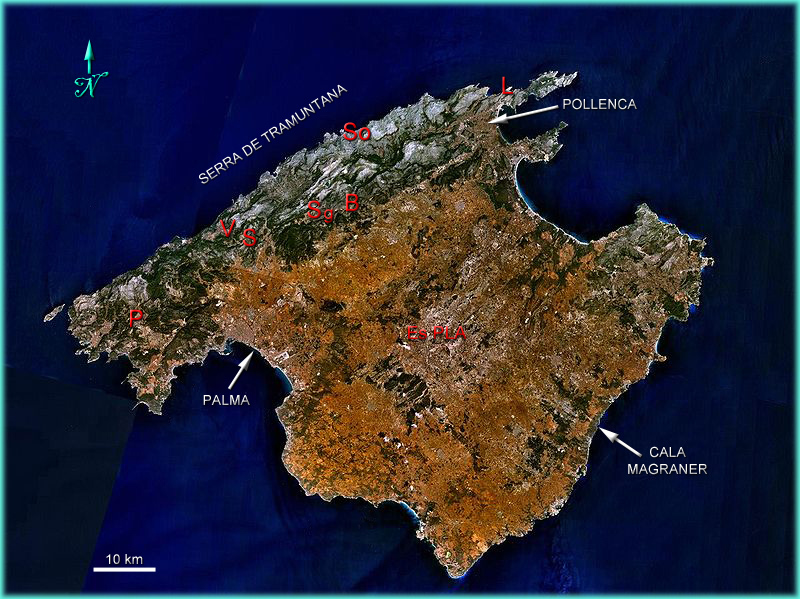 A Google ‘flyover’ indicates a highly sculpted NW coastline and the mountainous region referred to as Serra de Tramuntana (about 70 Km long) where much climbing has been developed, although there are caves and sea cliffs on the opposite side of the island as well. 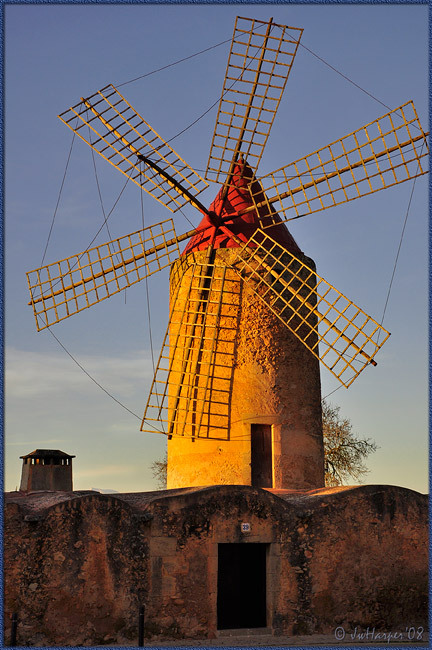 The large central plain known as Es Pla is generally flat, fertile and full of quaint little villages and vineyards as well as almond, lemon, and olive groves. The island is about 3,640 sq. Km in size with a population of around 600,000. About half the people live in and around Palma, the ‘capital’ city. 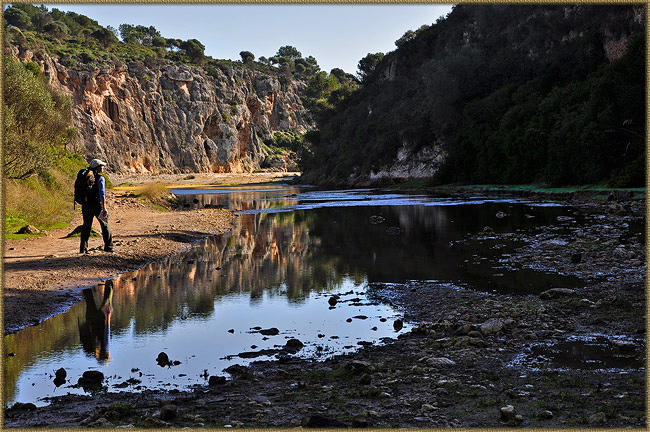 We stayed near the little village of Bunyola (B), only 15 km from Palma yet a largely overlooked village with almost no tourists, very little English spoken and relatively unchanged for centuries. 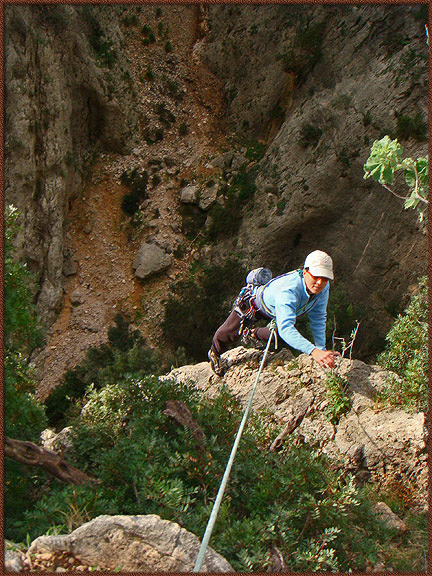 It is centrally located to most climbing areas and as it turned out, a very good choice – only a 30-minute hike to Sa Gubia. Finca Sa Maniga, buried within a pine forest and surrounded by orange groves was our base of operations. 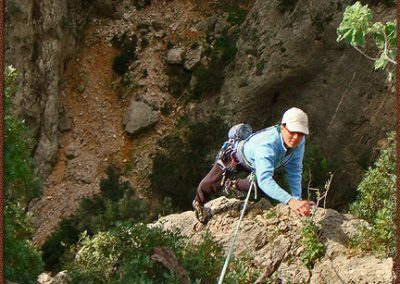 We sampled many climbing areas including Puig de Garrafa (P), S’estret (S), Valdemossa (V), areas around Soler (S), La Creveta (L) and the sea cliffs at Cala Magraner (see below). 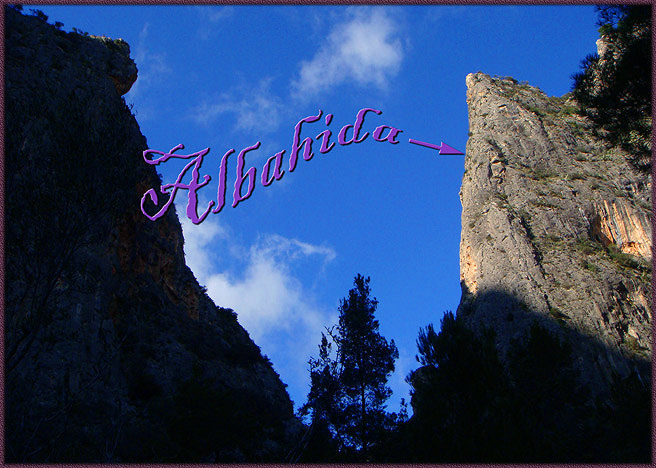 Ironically, however, the standout climb was an easy trad route up a thousand foot, 7 pitch arete at Sa Gubia (Sg) called ‘Albahida’ (see #1 below). 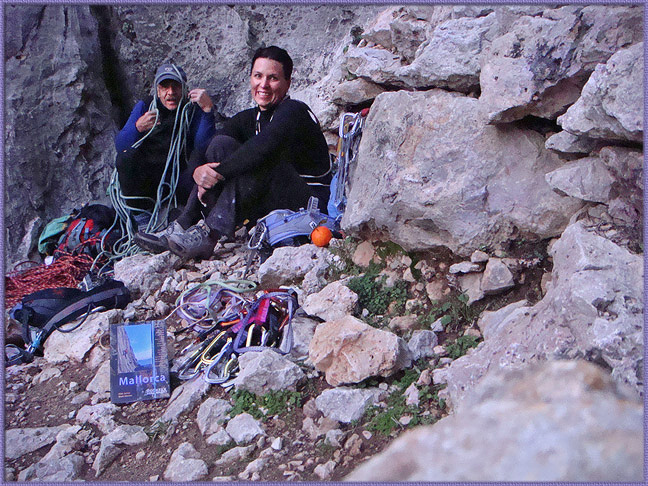 It was December when the days are short, so we hiked in prior to sunup and, after rapping down a bolted companion route named La Ley Del Deseo, finished at dusk. 2.) = first pitch 3.) 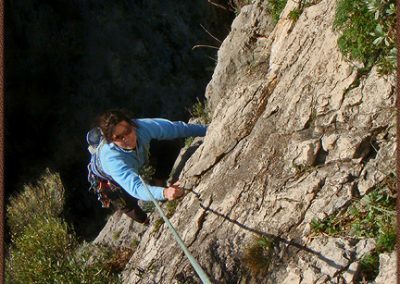 = third pitch 4.) = very near summit 5.) = down, finally! 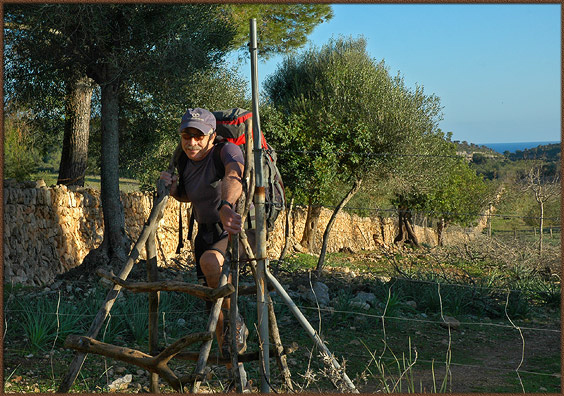 Crossing over the “rickety stile” near the road. Scouting down the valley, Sector Cueva is seen. The beach at the cove, Sector Xorics is on the left. 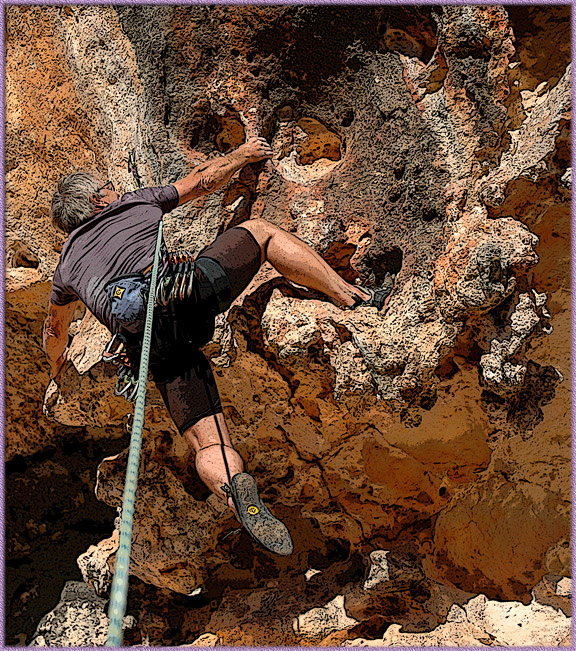 The opening moves of ‘Cave Right’, Sector Pipiricot. 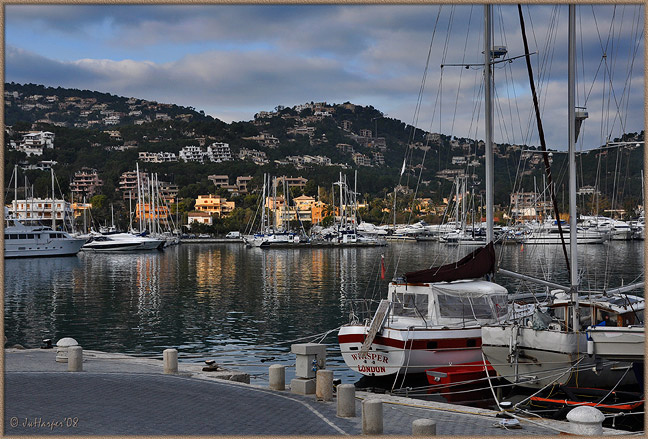 The harbor at Andratx, near Puig de Garrafa. 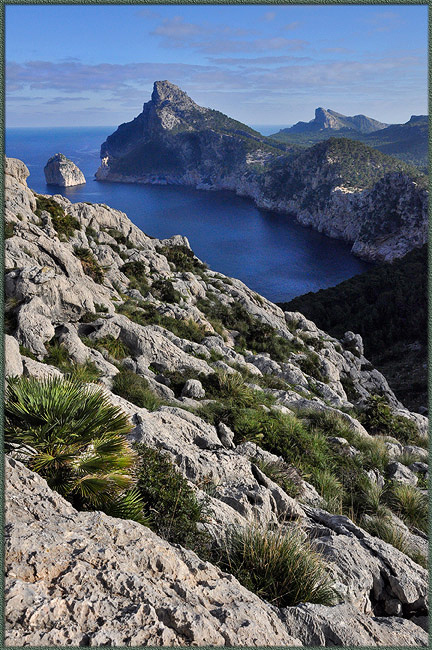 Cape Formentor, the far NE point of the island, near the La Creveta Cliff. More working….. DEFINITELY A FANTASTIC PLACE TO VISIT!!! !